Part 303 requires a wetland construction permit application to be submitted, and a permit obtained, prior to undertaking any regulated activity (e.g., dredging, draining, filling, maintained use or development, etc.) within regulated wetlands. Part 303 does require the applicant to properly identify the location of wetlands that may be impacted and verify that the applicant has taken steps to avoid or minimize any impacts to wetlands. 1) General - General permits are issued for category of activities that are similar in nature and have only a minimal adverse individual or cumulative effect on the environment. In the current program, applications under a general permit still undergo a full review and must meet all regulatory standards. However, the general permit process allows the Department to reach a decision without public notice and without a site inspection. 2) Minor Projects – Minor project permits are issued for those projects deemed to have minor impact upon the aquatic resources. Minor projects still undergo a full review and must meet all standards, but no public notice is required for minor projects. 3) Individual - Activities in wetlands that involve more than minimal impacts require individual permits. Individual permits require public notice in which public hearings may be held to acquire information and give the public the opportunity to present views and opinions. 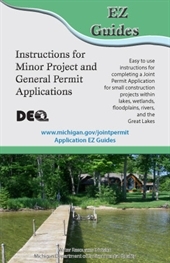 Since Section 404 permitting is administered by the Michigan Department of Environmental Quality (MDEQ), for most projects, only the MDEQ permit is needed. A federal permit from the U.S. Army Corps of Engineers (USACE) is only required for work proposed in Section 10 navigable waters of the United States. This is in addition to the DEQ permit. The Army Corps and the Department of Environmental Quality use a joint application form (which is delivered to the MDEQ) and may issue a Joint Public Notice, but separate permit actions are taken by the two agencies. You need to receive a permit from both agencies prior to starting any work. The EZ Guides provide guidance on how to meet Minor Project and General Permit criteria, provide examples of drawings and photos to include with your application, and indicate what sections to complete in the application form. Pre- Application meetings are offered by the MDEQ to review a proposed project prior to submittal of a full application in order to facilitate preparation of an acceptable proposal and expedite permit processing. A pre-application meeting can be conducted at a district office or at the site of the proposed project.